New Melones Lake is currently holding 614,371 acre-feet of water. The lake level came up three feet this past week and will continue to rise with the recent and upcoming rainfall. It is currently at 880 ft. above sea level and 203 ft. from full. The water clarity is clear in most of the lake with a slight stain in some areas. There is some debris floating on the surface. The water temperature is cooling, with the average being 52-55 degrees. THE CONCRETE RAMP ON GLORY HOLE POINT IS OPEN!! Will Cunningham of Vallecito caught a nice 2-pound, 14-ounce rainbow trout. He was bank fishing with a casting lure when this fish hit. A large portion of the lake has turned over and the surface temperature is cool enough for the trout to be holding up top. Most anglers are targeting the top 15' of water to catch planted fish and large holdovers. The main lake has been producing, but many fish can be found in creek channels and wind protected pockets. Trolling anglers have been primarily top-lining and also incorporating the use of leadcore line. When fishing near the surface it is best to use lures that float or sink at a slow rate of fall. Rapala Floating Minnows, Jointed Minnows and Shad Raps work well. Light trolling spoons are also a good choice. Hot Ticket, Excel and Speedy Shiner lures are designed to be trolled and will stay up near the surface. Add a small weight inline, if you want your lure to sink a little faster. Be sure to let plenty of line out behind the boat, 150' to 200' is recommended. Bank anglers are starting to bring in limits of fish caught from the shoreline, mostly planted fish along with some really nice 3 to 5-pound holdovers. Try using Power Bait or a mallow/crawler combo. Be sure the bait is floating up off the bottom. Garlic scented Power Bait and Power Eggs will attract fish and draw a few more strikes. Fishing lures for actively feeding fish has been a productive approach. Try using casting spoons with a reel/twitch retrieve. A steady reeling retrieve will entice the fish to follow and the twitching action will force them to make a decision rather to bite or not. Brightly painted lures have been producing strikes. Glory Hole Sports Big Fish of the Week goes to Mark Schneider of Angels Camp. 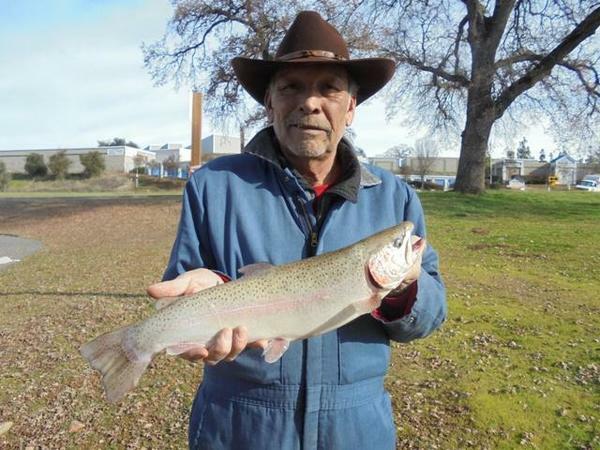 He caught a beautiful holdover rainbow while fishing with Power Bait from the bank. His fish weighed 4-pound, 2-ounces. Michael Nelson and Bill Martin (pictured) had a very successful day top-lining on New Melones. They reported catching and releasing 35-trout including this beautiful 3-pound holdover. The season has come to an end and the kokanee most likely are done spawning. April is a good month to start targeting the kokanee again. The winter bite is in full swing and most anglers are catching some really nice spotted bass and largemouth. The water temperature continues to cool, but is not extremely cold yet. The fish are relatively active and willing to bite. Many fish are going to be holding in 30' to 50' of water. Some fish will move shallow periodically to feed and can be caught near the shoreline. The shad and trout have moved into creek channels and pockets off of the main lake. The bass will follow the bait. A great deep water technique that will work during the cold winter months is a vertical jigging spoon. Try locating large balls of bait and fishing a spoon near the edges, under and above. Sometimes the bass will hold in large standing timber near the edges of creek channels. They will wait for the bait to push into them and use the tree to coral an ambush. Try using a weedless worm fish in and around standing timber. A Texas Rig with a shad patterned worm or a Senko is a good choice for catching fish in heavy cover. Small swimbaits fished at various depths will also coax these fish into biting. Many fish will scour the bottom and feed on crawdads and other bottom dwelling creatures. A football head jig will work great fished slowly across the bottom. Light jigs work great when the fish are biting on the fall. Use heavier jigs for bumping into structure and grinding the bottom. Some anglers are catching big largemouth on trout patterned swimbaits. PLEASE PRACTICE CATCH AND RELEASE. Take photos and carefully release the fish back into to the lake to maintain a healthy fish population for generations to come. Fishing for catfish during the winter months is usually pretty slow. Large fish can be caught at this time each year, but not many. It is best to use a ball of Power Bait or Float a crawler. This way you will have a chance to catch both trout and catfish. For specially targeting giant cats, try using a whole mackerel with a double hook rig. These fish tend to hibernate during the cold months and will only move to eat a substantial meal. Very few anglers have been targeting the crappie. The winter months can be good and the crappie will move into creek arms.